This hash is one of my favorite foods in the whole wide world. 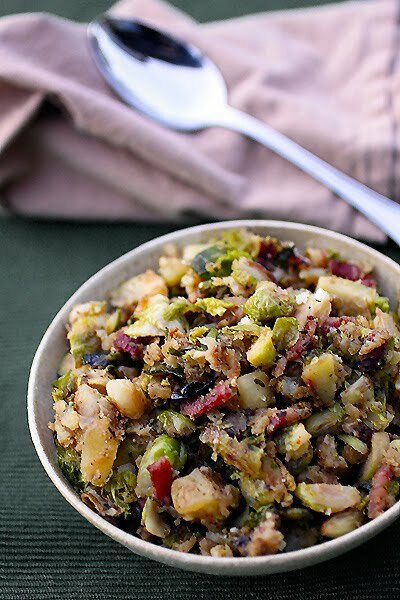 Bacon, potatoes, Brussels sprouts, garlic, onion, Parmesan cheese and a touch of hot sauce make up this heavenly dish. The picture isn’t my favorite however. I didn’t have time to set up the shot and was running out of light. I ended up opening my aperture to f/2.5 to grab a steady picture, which I dislike, but the recipe more than makes up for the bad photograph I promise! I feel like I’m chasing my tail this week. I can’t keep up to save my life! Anyone else feel this way? It can’t just be me can it? I make this hash in a ginormous skillet. If you don’t have one you can cut the recipe in half, or make in batches. 1. Scrub potatoes and stab all over with a fork. Place on a paper towel lined plate and microwave on high until pierced easily with a knife. Cool a bit, peel off skins and cut into large dice. Set aside. 2. Clean and peel outer leaves from Brussels sprouts. Cut off stems and cut into quarters. Set aside. 3. Cut nearly frozen bacon into small strips. (Bacon cuts easier frozen). Place bacon in a very large skillet over medium to medium high heat. Cook until crispy. Turn off heat and remove bacon from skillet with a slotted spoon and strain on paper towels. Leave bacon grease in the pan. 4. Add 2 tablespoons olive oil to the skillet. Turn heat to medium high and add diced onion, thyme, onion powder, garlic powder, parsley, salt, and pepper. Cook until translucent and add Brussels sprouts. Cook until softened. 5. Clear a small area of the skillet and add minced garlic. Cook for 30 seconds or just until fragrant then mix into the sprouts. Add potatoes and warm through. Add chicken broth and hot sauce and stir. 6. Let potato mixture brown and crisp with chicken broth, folding the mixture occasionally. This may take awhile. Hash will be done when there are some crispy parts, the broth is absorbed, and everything is heated through. Stir bacon and Parmesan cheese into hash, taste for salt and pepper and adjust seasonings if needed. I love bacon with brussels sprouts and I love bacon with potatoes. I may just love it much more if you put everything together. I know the feeling of being super busy. I hope you take some time to slow down for yourself. I know how you feel, Laura. I am going through the same thing. That is why I haven't updated as often as usual. Take care. P.S. I scoffed at your comment about my cake looking better than yours. I HIGHLY doubt that. highly. I so love this tasty winter dishes!! The flavours go all so well together! Looks very healthy & and ooh so tasty! buonissimo questo piatto unico!! le foto sono super!! This looks so good! I have loved brussel sprouts since I was a kid (weird, I know) and this looks like a great way to prepare them. Thanks for the idea! Oh dear... I could eat a whole lot of this yummy hash. Hash is such an underrated dish! I love brussels sprouts and you can't go wrong by adding bacon. This looks delicious, can't wait to make it! Looks wonderful, love your photos. Beautiful site! 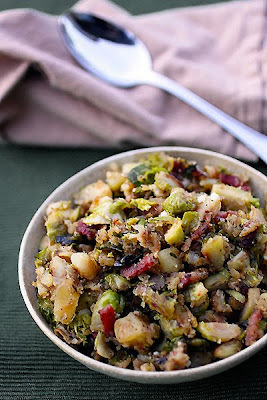 I love Brussels sprouts... And, this looks like an incredible dish! I want some for breakfast... Is that weird? I don't know why, but I'm not digging it and the weird part is I still want to make it! I think it's because you like it and I trust you so much. Scary, huh? ;) And no, you're certainly not the only one that can't keep up! Such is life. Delicious! My family is going to love this recipe. I love brussel sprouts and this will be a great way to eat them! ohh I think the dish looks tasty! (oh and sorry, but we are super far behind on commenting). Love the combo of ingredients! Oooh yum. That looks amazing. I'm going to try that on my husband, who doesn't like brussels sprouts and the kids, who don't like those or potatoes. Thanks for sharing. It looks like a perfect autumn dish! Have you tried adding chopped boiled beets? They give the dish a beautiful red color. You just boil them in water until they become real soft and sweet, remove the skin, wash and chop!